June 1, 2015 sees the release of a new book by Tea Krulos, a 313-page volume from the Chicago Review Press you will want to read. Krulos’ previous book, Heroes in the Night, about real life superheroes roaming urban America, was well-received. I expect this new one will be actually more popular. This newly published work from Tea Krulos promises to outdo his first book. 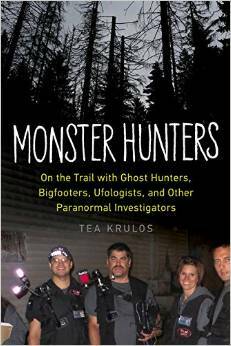 Entitled Monster Hunters: On the Trail with Ghost Hunters, Bigfooters, Ufologists, and Other Paranormal Investigators, it will be a favored and social media trendy book among cryptozoologists. While the topics go beyond the study of hidden and unknown animals, it will be the cryptozoology threads in the book that will propel it into the hands of the most readers of this blog and similar ones. “Squishes,” by the way, is about Sasquatch seekers and Bigfooters. Thus, Krulos follows the followers of Bigfoot, Chupacabras, Bray Road Werewolves, Mothman, Shunk Ape, and Lake Monsters around to find out about why they chase and chronicle these cryptids and creatures. The key to understanding the underlying theme of Monster Hunters is that the volume is about the people, not the creatures, the cryptids, and the monsters. Krulos’ subjects are the seekers, hunters, investigators, and chroniclers of the phenomena, not the unexplained elements of his story. 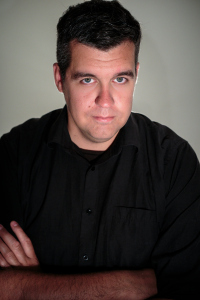 He does a great job achieving that goal with humor, sensitivity, and insight. It is sometimes best to closely review those parts of a book you know best, because therein you can determine the author’s grasp of the facts and follies related to the people the writer encounters. For example, Tea Krulos’ writing style is genuine, informative, and praiseworthy of the International Cryptozoology Museum, our assistant director Jeff Meuse, and me, Loren Coleman, the director. Krulos spent a year, going on expeditions, excursions, and explorations with the seekers he writes about. He came to the International Cryptozoology Museum to get a tour and interview me, and he went on Champ Camp with Jeff Meuse and others to learn about Lake Monster cryptozoology from the folks doing the work. He captured his topic – the people – brilliantly. Krulos’ first chapter will be required reading for every new staff, and current & future docents/volunteers at our Museum, now. The book is outstanding, and clearly overviews and conveys my introduction and the personal history of the Museum’s cryptozoology collection nicely. The International Cryptozoology Museum is already evolving from its origins, as it is a 501(c)3 reaching for a broader legacy, and becoming the people’s Museum now. 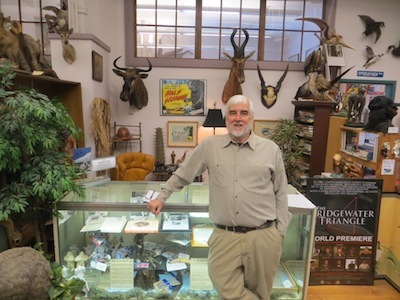 Krulos’ book will serve as a fine historical document, for years, introducing the general public, as well as cryptozoology students, to the motivations and mission behind the preserving and sharing of the Museum’s collection with the greater world. Krulos does the same throughout the book, in a well-written fashion, for many investigators and their varied topics. But this is no TMZ/Entertainment Tonight publicity scripted book. No, Krulos gives forth with his own insights and critiques, and tells his stories with an outsider’s view to a larger reality. Take a journey around the country with Tea Krulos. You will enjoy joining the quest through his eyes. Monster Hunters: On the Trail with Ghost Hunters, Bigfooters, Ufologists, and Other Paranormal Investigators, with 17 color photographs, internal b&w photos, chapter head drawings, extensive bibliographical notes, and a detailed 17-page-long index, is highly recommended. Read Tea Krulos’ reaction to this review, here.